The Space Pirate Dragon is a true bandit and is as evil as he looks. Legend has it, this ruthless creature is searching between galaxies and multiverses for his stolen treasure and once found, he will make the culprit walk the plank. How to Breed Space Pirate? 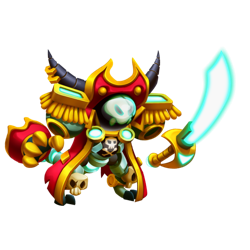 Space Pirate is not Currently Breedable. Sorry. These dragons can all critical hit against Space Pirate, but won't be critical hit by Space Pirate.